The three-party alliance government escaped a no-confidence motion by 104 votes to 60 in parliament on Wednesday. Photo – Lehtikuva. The government on Wednesday survived a no confidence motion brought by all the opposition parties excepting the Christian Democrats in the parliament. The three-party alliance government escaped the motion by 104 votes to 60. Thirty representatives missed the vote and five abstained in the motion primarily concerned with education budget cuts. The opposition parties believe that the country's level of expertise and future is in danger as the government embarked to cut more than euro 2.9 billion in education and research by the end of the ongoing session of the parliament. The opposition has criticised the government's actions in increasing the classroom sizes of early childhood education and primary schools, in reducing teachers, in cutting research funding and in reducing the number of doctorates by a fifth. The lawmakers of the treasury bench and the opposition argued on Tuesday over the size and breadth of the education cuts. 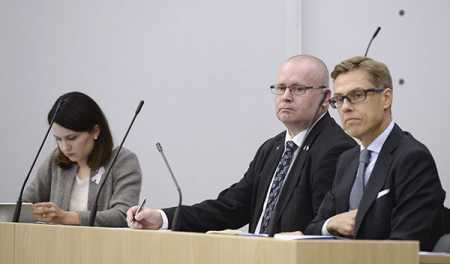 Minister of Education and Culture Sanni Grahn-Laasonen, Justice and Employment minister Jari Lindström and Finance Minister Alexander Stubb in the parliament on Wednesday. Photo Lehtikuva. The government claimed that the cuts will amount to euro 641 million by 2020 while the opposition pointed to euro 3 billion in cumulative cuts. 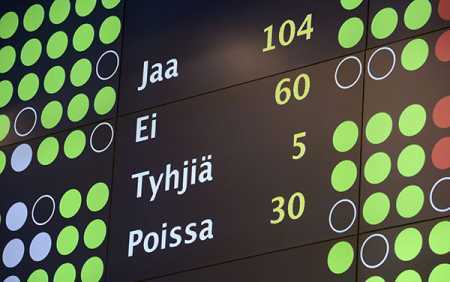 Earlier, the major opposition parties in the parliament Suomen Sosialidemokraattinen Puolue (Social Democratic Party of Finland), Vihreä liitto (Grean League), and the Vasemmistoliitto (Left Alliance) on September 15 agreed to table an interpellation on education cuts before the parliament. The government's recently announced top priority areas that promise euro 300 million funding for education has been termed by the opposition as inadequate patch to cover for the massive losses in education.